This post about the Anthropologie May 2018 new arrivals contains affiliate links. Please read this blog’s disclosure post for more info. Happy Wednesday! Apologies for the relative silence around here — my Mom is less than two weeks from moving into her new condo! I find myself tasked with a ton of items to help her move go smoothly. Add a day job, wedding planning and our own house hunt on top of that, and well, I’ve barely slept lol. I am working on a small series of Spring/Summer shopping guide posts that I hope to have live in the next couple of weeks. In the meantime, thank you as always for your patience while I help Mom with her move!! Most of us weren’t too impressed with Anthropologie’s May pre-shop. As is usually the way, I’ve found a crop of items from the non-catalogue Anthropologie May 2018 new arrivals that are more my speed. I’m noticing some trends — ruffle sleeves on tops, embroidery on bottoms, and mixed prints in dresses. It’s a mixed bag of successes and fug. I have to tell you that I haven’t been drawn into Anthropologie stores lately at all. Not even the survey discount got me excited the way I hoped it would. Right now, Anthro is running a promotion on outdoor living and I’m sure a clothing promo isn’t far behind. Will these newer items be the thing to draw me in? I’m delighted by the possibilities of tops like the Palm Palm Springs Fringed Blouse ($128, above) and the Martell Halter Top ($78). 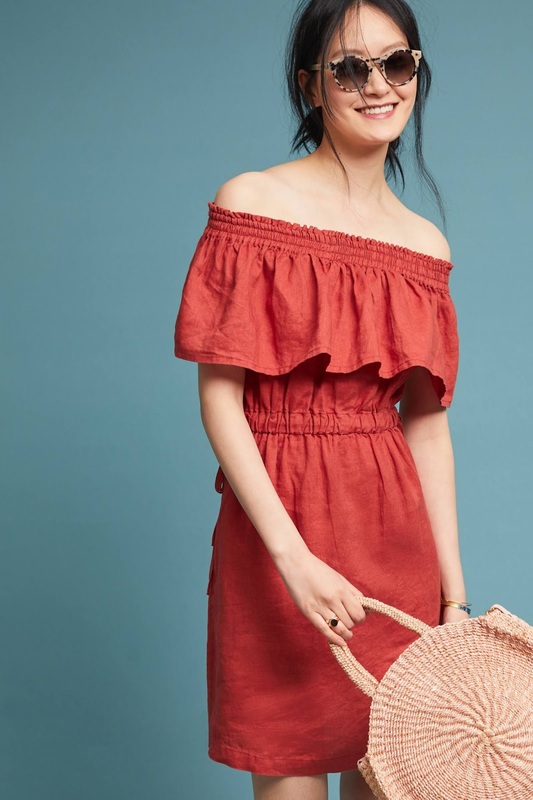 There’s styling potential in dresses like the Linen Off-The-Shoulder Dress ($158, below) and the Violette Dress ($148). Shop: I love the color of this dress! Anthropologie is still missing in its overall collection for me. I just can’t get excited about it! Or, when I am excited about a bunch of items I see they’re all online only and that’s such a shopping turn-off. I’ve been doing most of my shopping at Nordstrom (even driving 45 minutes to get there! ), Saks, American Eagle and Old Navy, all of which allow me to look up store inventory online and are always accurate. Madewell is another destination for me, and though I have to call their Icon concierge line for help, I also get the lovely perk of free 2-day shipping with them! LOFT, Amazon, Shopbop…they’re all getting my spending money in front of Anthropologie. Still, I find myself coming back to Anthro’s site often, in the hope that they’ve got something special. If they can turn around their styling, get shoes and jewelry back into stores, and quit it with the online only inventory disasters, there’s a distinct possibility. Below, my picks from the Anthropologie May 2018 new arrivals. What’s worked for you recently at Anthro? Next Post Happy Mother’s Day! A few quick updates. That is such a cute CLC dress. Do you have any sense on sizing? This is adorable! While I prefer cotton, I'm ok with this fabric. I just wish listed it! Love the style of this one…it would be a great work dress but I’m not felling the giraffe print for myself. Others will be able to rock it!! I wish they offered it in another print. I like it! I didn't notice it before. It reminds me of a grownup version of the Lilly for Target Giraffe-y dress from a few years ago. I LOVE that CLH dress! Thanks for pointing it out. The giraffes are absolutely quirky in a cute way, imo. I think it’s quirky cute! But the material gives me pause. Can Anthro please give it a rest with the viscose and rayon already?? I'm shooting for the SP as I'm 5'3. I can do reg. sizing if the length isn't past 36" so I'm going to see how the length in Petite is. It arrives at my house today so we shall see! I'm keeping it! It's super cute. You definitely need the Petite size. The length is just above my knee. It won't be too short for sure. Thank you so much! Did it fit true to size? I have never tried this brand, but I'd hope I could go with my usual size. I'm so glad you liked it! I'm not overly excited about this months offerings. I do love the sandals from Morena Gabrielli! I'm a sucker for animal prints, colors and bows (the one with bows reminds me of a pair at Talbots right now). On a separate rant, do stores carry any stock? It "feels" like everything is online and has to be shipped to a store. What is the point of brick and mortar? Wow, Roxy, you are very busy. That's really nice that you are helping your mom! Wedding planning and house shopping, two really important life events that deserve all the time and attention you need to give them. Thanks for sharing your picks. I'm looking forward to your upcoming posts and will happily wait, patiently. I agree with your sentiments, I have actually ordered a few articles of clothing from Anthro recently but returned everything for one reason or another. I have kept a couple pairs of shoes as I’m really like Anthro’s offerings on that front right now! Overall I’m disappointed particularly in their dress and top offerings I feel like we are starting to see a lot of romper/jumpsuit/kimono/OTS offerings again…I thought Anthro may have learned their lesson last year. I’d to see more bra friendly and work friendly options. I have a big bust and I’m not seeing a lot of looks that would flatter my figure….and many that are bra friendly and/or have a more flattering silhouette are only available in limited size runs. ie nothing bigger than a 12 or just S, M, L … No one store is doing it all for me these days but I’ve managed to find a few things at Boden, Nordstrom, Kate Spade and Talbots. Best of luck getting your mom moved into her new place, and I hope that she is happy there! I know what you mean about not being impressed with Anthro but not being able to walk away. It's like that friendship where you no longer have anything in common, but there's history there, so you still keep in touch. I can say I like a piece, but the days of getting really excited about shopping there (or browsing the website, even) are over. Free People and Loft are getting the lion's share of my spring and summer money. I did go into a store last week, and I really have to say that they are trying. There are more natural fabrics. In-house brands are prominently featured – I'm seeing a lot of Moulinette, Postmark, Meadow Rue. – and brands I thought had vanished, like HD in Paris,. ett twa and Vanessa Virginia. And have you noticed they've changed the labels on these brands? They now read: Moulinette Sours, by Anthropologie – they really want to hit home that these are house brands. So, that is good. Also, my main Anthro is showcasing a LOT more jewelry. YAY! Lined up waiting for a promo, this peasant top. It's not too oversized, https://www.anthropologie.com/shop/pernille-tie-s… , this kimono: https://www.anthropologie.com/shop/josephine-croc… these adorable platforms: https://www.anthropologie.com/shop/anthropologie-… and these pretty hoops: https://www.anthropologie.com/shop/green-paradise… Love Gas Bijoux! What are chances for new markdowns tomorrow? I feel like it's been a while. I didn't buy anything recently from Anthro or other retailer. I had 2 birthday parties to organize in April and didn't have mental capacity for anything else. I bought the lilka patchwork trapeze dress yesterday, brought it home, and decided it was too short, so it’s going back. Where can I get a fuller slip ( not straight) with a wide lace hem? Im going to try the Brisbane maxi in green, it’s right up my alley and I gave a polo match event in june I need a dress for. And I've bought a ton of jewelry https://www.anthropologie.com/shop/matilda-cluste… so delicate https://www.anthropologie.com/shop/blooming-post-… so big but I'll wear them with the Evelyn dress like the model https://www.anthropologie.com/shop/gola-coaster-m… so adorable, I'm wearing them without socks! So that's about it so far. More jewelry to come, dresses and peasant tops when I can find some more $$. There is also so much stuff to scroll through and I often miss things that I would probably like since I don't want to go through 12 pages of items, maybe they should pare it down some. It is nice to have options but I usually only find 5% of the items something I might consider buying if I take the time to look through everything. I just don't understand clothes at Anthropologie right now. I think the one word description that I think is missing from the apparel is "pretty." This is the first year in history that I could not find a pretty and elegant (but not over the top mother of the bride type) dress for my spring piano recitals. I will not pay over $220 for a dress either for often a one time wearing. Everything, particularly in dresses, seems too resorty and casual. I am sick of this look from Anthro already. I hate island type prints and big gaudy type flowers or palms or whatever. And the pants, my god! How about a pretty, sleek, flowy full length pair in cream or something that you can pair with anything? Been through the paper bag waists once in my life already. Didn't think they were flattering then nor do I now. It still all seems like a hodgepodge and it doesn't feel like they listened to their customer base at all with all the complaining we did to them through the surveys. It almost feels like they said, well f-you, anyway! It's almost like Anthropologie is using their web site to frustrate us so much that we just go to the store LOL…The stores near me are a lot more pared down and edited (clothing wise) than in the past, while the web site is an ill-styled hodgepodge of confusion. 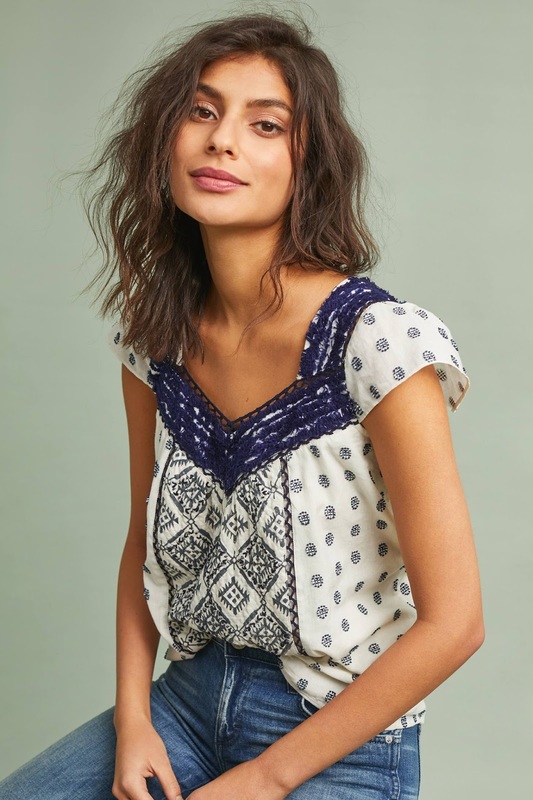 I saw one thing in the May catalogue that I really liked and ordered it (the Eclectic Peasant blouse), but will have to wait until after June 23 for it to ship. That's about it. Good luck on all your life things, Roxy (mom's move, wedding planning, house hunting, etc.)! Did anyone notice the fanfare bib necklace. Its been catching my eye repeatedly and I am wondering if I should get it shipped. https://www.anthropologie.com/shop/fanfare-bib-ne…. I absolutely relate to your comment about coming back to Anthro with hope of finding something special, but I really don't hope for much these days. My local store has very limited stock, sometimes some shelves are literally empty, it's kind of sad. It's my birthday month and I actually used it to buy a couple of cute t-shirts from Sol Angeles and T. La, they are still way overpriced but the discount helped, and they are cute and of good quality. The majority of clothes I saw in the store just looked flimsy and not at all special. Still, I'll keep coming back… and sometimes I find some good stuff. I guess that most of us are in the same boat. I regularly stop in to my local Anthro but rarely buy anything. There used to be stuff that I felt I couldn't live without (but clearly I could) but rarely is there anything in that category now. It was always the sales that lured me in but, once there, I would buy full price. With markdowns only every 3 weeks or so I am less inclined to even stop in. I still find stuff that is pretty but just not different enough to justify the expense. It is sad. The prices are spiraling out of control. I'm trying to be fair-minded and compare to other brands I buy from and I just can't justify the pricing. For example, a new cotton tank top came out just now and it's $118. Even with 20% off, it would be close to $100. I've bought a handful of things this spring, but they were all sale items or were originally under $100 and doable with a promo. Good luck! I agree that the basic t-shirts are more reasonably priced. I've always gone for the more froufrou stuff at Anthro, which tends to be expensive and has become even more so of late. I've seen a bunch of new pretty things added this week but it all comes down to fit and fabric feels for me. Anyone else hoping for sale to be upped to 40% off this weekend along with a 20% off promo FP for us Moms? I know I am! Where is everybody? Out enjoying this gorgeous spring day I hope! I just got back and now am looking at all the great Maeve items. They are rocking it! I hope it's reflected in the quarterly profits for Anthro. I'm going to buy some shirts and dresses today. One thing I'm not having luck with is the cheap jewelry. Why won't they sell size 8 rings? Why does everything sell out so fast? Why do the chains fall apart so quickly? I agree totally about being sick of online shopping. I can't stand not seeing items in-store and having to pay shipping and then go out of my way to return items that don't fit or that I don't like. It's a huge waste of time and effort. And it takes all the fun out of shopping for me. I like going to the store with a friend and having a shopping day. I will say my local Anthro was stocked to the gills yesterday when I went in to return my online purchases. But I walked out with nothing bc nothing grabbed me as a must have. Also let me mention that I guess the new Anthro rule is no charge-sends? This makes it especially frustrating as various stores have stock but you cannot order the item anymore. Other question is why does site show sold out when the stores are stocked with the items showing up as sold out online? I am now frustrated as they are making shopping more difficult and less fun. I refuse to shop online unless it is something that I have bought before and know the fit etc.. The new Anthro rule regarding charge-sends seems to be that you can do them but only if you go into a bricks and mortar store, buy a gift card for the actual amount (or more) and use that. WAY too much work. I believe that Anthro is doing quite well at the moment so are not too concerned about losing business.